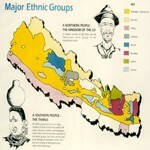 The population comprises of about a 101 ethnic groups speaking over 92 languages. The distinction in caste and ethnicity is understood more easily with a view of customary layout of the population there exist numerous dialects, and the language of unification is the national language, Nepali which is the official language of the country, spoken and understood by majority of the population. Multiple ethnic groups have their own mother tongues made up of over 40 different races and tribes. English is spoken by many in Government and business offices. It is the mode of education in most private schools of Kathmandu and some other cities. The country offers such diversity that the visitor may experience any lifestyle from the stone age, in far west and high hills, to the jet age of Kathmandu. The two major groups in Nepalese society are Tibeto-Burmans, or Mongoloids from the north, and Indo-Aryans from the south. Many customs are inherited from both sides and have been developed by the influences of the land, climate and available resources. 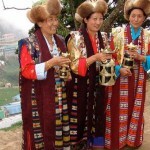 In the northern region of the Himalayas are the Tibetan-speaking groups namely Sherpas, Dolpa-pas, Lopas, Baragaonlis, Manangis. The Sherpas are mainly found in the east, Solu and Khumbu region; the Baragaonlis and Lopas live in the semi-deserted areas of Upper and Lower Mustang in the Tibetan rain-shadow area; the Manangis live in Manang district area; while the Dolpa-pas live in Dolpa district of west Nepal. Several ethnic groups live in the middle hills and valleys. Among them are the Magars, Gurungs, Tamangs, Sunuwars, Newars, Thakalis, Chepangs, Brahmins, Chhetris and Thakuris. There are also occupational castes namely: Damai (tailor), Sarki (cobbler), Kami (blacksmith) and Sunar (goldsmiths). Kathmandu Valley represents a cultural cauldron of the country, where, people from varied backgrounds have come together to present a melting pot. The natives of the Kathmandu Valley are the Newars. 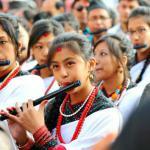 Newari culture is an integration of both Hinduism and Buddhism. The Newars of Kathmandu Valley were traders or farmers by occupation in the old days. The largest groups can be divided on the basis of geographical locations by altitude.